AP ICET 2019 - Andhra Pradesh Integrated Common Entrance Test (AP ICET) 2019 is conducted by Sri Venkateswara University, Tirupati on behalf of A.P. State Council of Higher Education for admission into the Master of Business Administration (MBA), Master of Computer Applications (MCA) & Lateral entry into Second year of Master of Computer Application (MCA) Programs in University Colleges and their affiliated colleges for the academic year 2019. Interested candidates can check all the details of AP ICET 2019, like application form, eligibility criteria, application procedure etc from this page give below. Andhra Pradesh Integrated Common Entrance Test (APICET-2019) is conducted by Sri Venkateswara University, Tirupati on behalf of A.P. State Council of Higher Education for admission into First year of MBA & Master MCA Lateral entry into Second year of MCA Programs in University colleges and their affiliated colleges for the academic year 2019. The candidates who satisfy eligibility criteria stated above can apply for APICET-2019 through an online application in the website www.sche.ap.gov.in/icet the details of which are given in User manual. AP-ICET-2019 Applications should be submitted through online mode only; the Registration fee for online submission and late fee, if applicable, may be paid at AP online Centers in Andhra Pradesh and also through payment gateway (Credit card/ Debit card/Net Banking). Candidates should be Indian Nationals and should satisfy local/non-local status requirements laid down in the Andhra Pradesh Educational Institutions (Regulations of Admission) Order, 1974 as amended. Candidates shall satisfy the rules of the concerned universities where they take admission. Should have studied and passed 3-year Degree course in any faculty conducted by the Universities or its equivalent Degree Exam in 10+2+3 pattern as recognized by U.G.C (University Grants Commission). MBA - Degree of 3 years duration from any recognized University or its equivalent with Mathematics as one of the subjects at 10th class level. MCA - Degree of 3 years duration with “Mathematics” as one of the subjects at Intermediate or Degree level. MCA- 2nd Year Direct (lateral entry)- BCA or Degree holders in IT/CS with Mathematics at 10+2 or Degree level. Candidate who passed all the subjects of the three years of any Degree course in one sitting is not eligible for admission into MBA or MCA Course. The ICET question paper contains multiple choice objective types test with 200 questions. It is divided into three sections and the exam must be completed within 150 minutes. The three sections are Analytical Ability: 75 questions, Mathematical Ability: 75 questions, Communication Ability: 50 questions. 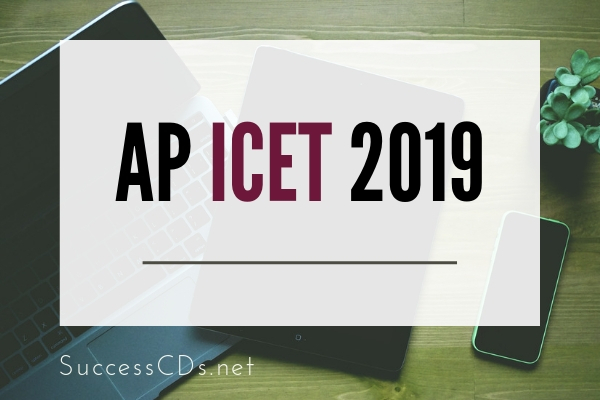 The AP-ICET-2019 Exam will be held at the following 17 Regional Test Centers in Andhra Pradesh(01) Adilabad (02) Amalapuram (03) Bhimavaram (04) Chittor (05) Guntur (06) Kadapa (07) Kakinada (08) Kuppam (09) Kurnool (10) Nellore (11) Ongole (12) Rajahmundry (13) Srikakulam (14) Tirupati (15) Vijayawada (16) Visakhapatnam (17) Vizianagaram.